In recent years, fraudsters have targeted these systems and are looking for new ways to get funds diverted to them. Payroll fraud is considered a form of asset misappropriation, a very common type of fraud that affects businesses. According to the Association of Certified Fraud Examiners, the cost of payroll fraud from fraudulent activity accounts for 8.5% of occupational fraud globally. The average case of payroll fraud may carry a price tag of over $70,000. 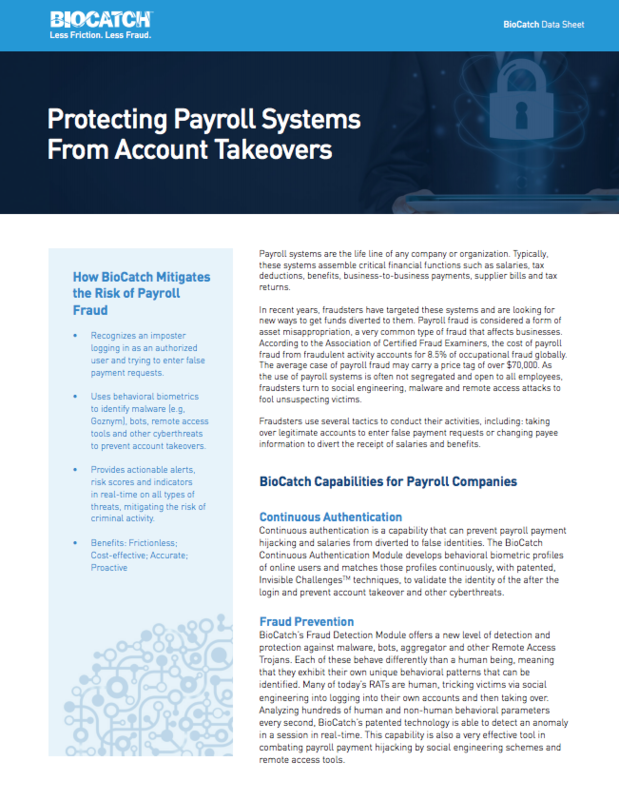 As the use of payroll systems is often not segregated and open to all employees, fraudsters turn to social engineering, malware and remote access attacks to fool unsuspecting victims. Fraudsters use several tactics to conduct their activities, including: taking over legitimate accounts to enter false payment requests or changing payee information to divert the receipt of salaries and benefits.